There are few Africans who have traversed the continent’s socio-cultural landscape for as long and with as much panache and penetration as Opral Benson. In Nigeria and Liberia in particular, she has been a steady and recurring cultural cardinal for over half a century, defining, conceptualising, and re-creating subliminal and popular trends in cultural and cross-national dialogue and diplomacy, and in beauty and fashion. Opral has been a constant figure in the movement for women’s development on the continent, playing such crucial roles that have not only awakened many women to their imperatives and strategies of advancement, but have also positively engaged men and leaders at various levels in the cause of developing women. As a beauty icon, she has been at the forefront of defining trends and customs for her contemporaries and younger generations. She has also explored beauty as an industry and a strong driver of business, and has economically empowered thousands of young people in the process. 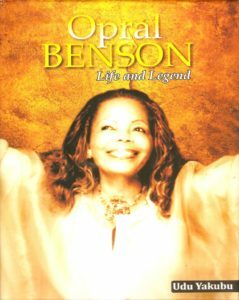 Opral Benson: Life and Legend is the portrait of a woman of uncommon vision and determination, and its captures the passion behind her social endeavours, and the deep impact of her life and work on society.